How do you pick a fun tipple that tastes great but won't have you drinking the liquid equivalent of a bag of sweets? Let us tell you. We've found out the secrets to picking the healthiest cocktail on the menu AND have found 10 of the most delicious healthy cocktail recipes in all the land that you HAVE to try tonight. Get it or regret it! Christmas is full of boozy temptations, and temptations that come in the shape of cocktails are way too good to pass, and because we would never want you to miss out, we've put together a list of healthy and more importantly, delicious cocktails. We also found out the ultimate hacks every calorie conscious girl needs to know when it comes to picking your drink from the cocktail menu this Crimbo. We spoke to to Michael Stringer, Mixologist and Director of BlackLeaf Events, who assured us, that there is such a thing as a healthy cocktail. He is indeed the deliverer of great news. ​​"People see cocktails as something which is always unhealthy and full of calories due to the alcohol and sugar content of syrups, but this is not always the case. There are many ways to ensure your cocktail is as healthy as it can be, for example simply using ‘diet’ versions of mixers such as tonic, lemonade and ginger ale can be a simple way to get less calories into your mixed drinks." 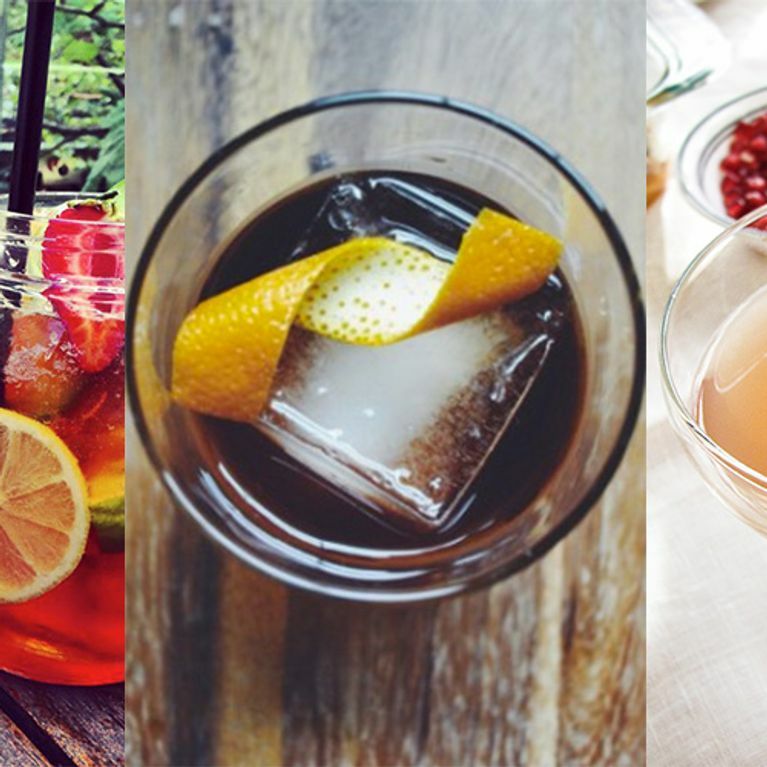 Sometimes simple swaps can be the best way to make your cocktail choice healthier. Michael says, "During our research to design a range of low calorie cocktails, we found that that sugar syrup was a big calorie additive. So try swapping the sugar syrup for ingredients such as, agave syrup or even making our own syrup using natural sweeteners, like the Stevia plant. "Another option to keep your cocktails skinny is to use fresh fruits which can be muddled or blended into mixed drinks - they're healthier than purees.​ We found some pre-packaged fruit purees can contain up to 20% or more sugar! By using fresh fruits such as strawberries, raspberries, banana etc you can cut out the added sugar and still have a delicious, and more often even a better tasting drink." See - cocktails don't have to be a sin! In fact, if you chose the right kind of fruit or veg based cocktails you could be doing yourself some favours. You could try watermelon which Michael says, "helps to control your heart rate and also peaches which are rich in potassium, fluoride and iron. You can also create savoury cocktails using vegetables - we actually like a new gin called Twisted Nose gin which is distilled using watercress." ​"The very start point of creating a lower calorie, healthier cocktail depends on which spirit you use as a base ingredient, although this is usually common sense. Gin and vodka tend to be the lowest with liqueurs, syrups and cream based drinks being the highest in calories." Another great hack for picking a healthier cocktail? Go for cocktails containing tea, especially green tea or matcha. Michael says they help to flush out the alcohol a little faster. We're convinced. So here are 10 cocktails you can enjoy, guilt free. The drink is named skinny for a reason, with just 105 calories, it is sure to go down great this Christmas. Mix the raspberry and two blackberries in a long glass. Add the purees, basil leaves, lemon, soda & gomme, and then top with cubed ice. Add the gin & churn. Finish by adding a mound of crushed ice to overfill the jar. Lets all rejoice in this healthy cocktail, the mixture of apple, pears and cinnamon (for a Christmas touch) is excellent for balancing out blood sugar. Garnish with grilled pear and a cinnamon stick. The veggie tipple that is great for everyone. An sultry, earthy mixture of beetroot, lemons, spices and of course booze. Muddle the beetroot with the sugar. Hair of the dog, the healthy way. The celery is sure to blitz away any festive hangover so you start another night of fun. Make the celery syrup by simmering equal parts of diced celery, sugar and water in a pan for five minutes and then strain. Place all the other ingredients into a cocktail shaker with ice. Muddle with the celery syrup, shake and then double strain in to martini glass. Garnish with a curl of celery. This glamorous cocktail is based on the natural sweetness and orange notes of Cointreau and is paired simply with fresh lime juice and soda water – and it’s only 150 calories! Add Cointreau, the juice of half a lime and top off with soda water. Garnish with wedges of lime. An English twist on a cosmo with Gin, raspberries, elderflower and a squeeze of lime, oh and it is only 95 calories. Place all the ingredients into a shaker and shake hard. Double strain the ingredients into a martini glass. Garnish with red currents and orange peel on the side. With a mix of fresh ginger, slices of orange and lemons, raspberries which have antioxidant benefits and fresh orange juice, this is the cocktail to warm your cockles. Put the vanilla sugar in a large saucepan and add the cinnamon sticks, cloves and 800ml hot water. Twist the lemon and orange peels to release their fragrant oils and add them to the pan. Place over a medium heat until the sugar has completely dissolved – this should take about 5 minutes. Once the sugar has dissolved, reduce the heat and add the orange juice, cachaça and raspberries. Heat gently for another 5 minutes. It’s important not to let it boil or all the alcohol will be burnt off. Ladle it into individual heatproof glasses and serve hot. Just because it is cold outside doesn’t mean you can’t pretend you're on a beach somewhere. Add rum and top with Cranberry Classic Light. Garnish with a cocktail stick speared with a lime wedge and Craisins Dried Cranberries. A healthy twist to the old favourite. Add all ingredients into a shaker. Low in alcohol by volume ( ABV) the Strawberry Milkshake ODDKA, allows you enjoy a milky cocktail without the guilt. Add the ODDKA, milk and ice cubes.